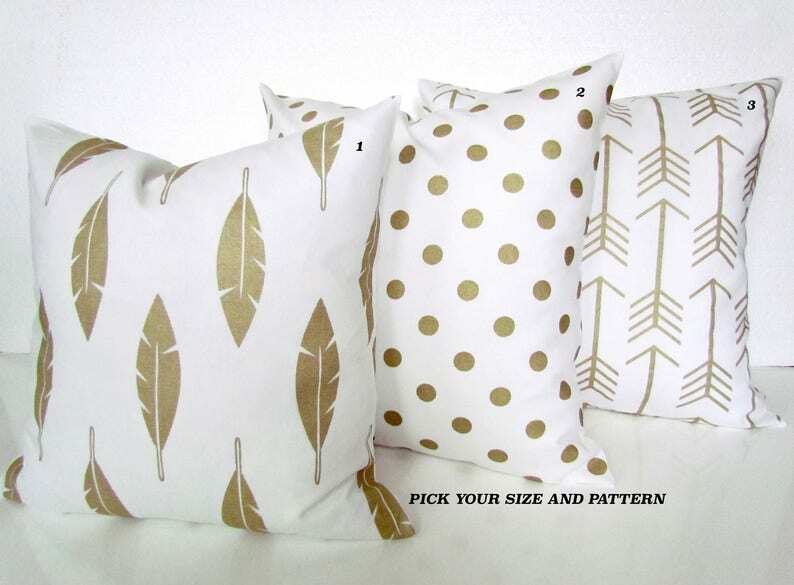 GET A WHOLE NEW LOOK JUST BY USING PILLOW COVERS! THE PILLOW COVERS CAN GO OVER A PILLOW INSERT OR YOUR EXISTING PILLOWS! Add a FRESH NEW DESIGNER LOOK to any room with this pillow cover made for any size of pillow. It features a gorgeous Arrow, Feather or Polka Dot patterns in the LATEST COLOR OUT; Gold Metallic on a white background. It is made up of 100% nice decorator weight cotton fabric (not thin craft fabric). The pillow insert is NOT included and can be purchased at Joann Fabrics. * The Printed Fabric is on BOTH SIDES -front & back. The pillow is made of high quality construction with a DEEP ENVELOPE CLOSURE that is triple stitched. * AVAILABILITY: AlLL of my FABRICS are available in ALL SIZES and ALL QUANTITIES. You can find everything in the "SHOP SECTIONS" on the left hand side of my shop. Just contact me if you don't see something you want. * CUSTOM: I also do custom orders. Just let me know what you need for fabric, size and quantity and I can give you a price. * SIZING: The pillow covers will come to you approximately 1" smaller than the listed size. For example: an 18" pillow cover (will measure 17") for an 18" pillow form. * SHIPPING: Orders will ship USPS in 2 to 5 business days, even most custom orders. The pattern placement may vary slightly from the photo shown. All of my items are handmade and will come to you from my smoke and pet free studio. Exactly what I expected- colors were as they appeared on my screen. Makes for a very nice update to my outdoor pillows. Pillows on couch and chair are all with covers from this shop. Amazing quality. Brilliant colors. Excellent craftsmanship. So pleased with these purchases! I accept checks, money orders and Paypal and ETSY Gift Cards. Note that Paypal accepts credit cards and debit cards even if you do not have an account with them. Etsy now offers direct checkout! Payment must be made at check-out time through PayPal. You do not need an account with PayPal to use this service and you can pay with a credit card or a debit card. THERE ARE NO REFUNDS ON CUSTOM ORDERS. SORRY. RETURNS: WE DO NOT offer returns or exchanges on any SALE, CLEARANCE, SEASONAL ITEMS, 12" or 14" pillows of any kind because it is so important to us that our customers receive top quality items that were custom made for that particular order. We also insure that our items came directly from our smoke-free and pet-free studio. We do offer a listing for fabric swatches if you are unsure about the coloring of a certain fabric. Depending on the circumstances, and within 7 days we will consider exchanges for a shop credit on a case by case basis. We will do all we can to make you happy with your purchase. No returns or exchanges on anything smaller than the 16x16" or larger than the 22x22". We also do not accept returns or exchanges on holiday or sale merchandise. Please Contact us within 1 week so we can help with your concerns. All pillow covers are made to order and will ship from 2 to 5 business days including most custom orders. I ship everything using USPS First Class and sometimes Priority with Delivery Confirmation so that we both have tracking information. I offer Express Mailing if an item is needed really fast at the USPS' pricing. Please communicate with me via Etsy's Convo system (rather than email) to ensure the fastest possible response and service. I welcome custom orders. Almost every pillow cover is available in different sizes and different quantities. Just let me know through a convo if you'd like a single cover or if you want to combine certain sets! Washing Instructions: Spot Clean Only. If absolutely necessary, hand wash with woolite and air dry only. Do not dry clean. PLEASE keep in mind that the covers will come about 1" smaller to ensure a snug fit. Your insert should be the same size as the cover purchased. IE: An 18" inserts needs an 18" cover. PILLOWS Gold Pillows Turquoise Throw Pillow Covers Aqua Turquoise Yellow Pillow Covers 16x16 18 20 Beach pillows nautical Pillows All Sizes.